Audio advertising is no longer merely the traditional marketing tool it once was. With the advent of online streaming services (Pandora, Spotify, etc.) audio ads have gained new prominence and importance. They are a direct channel to potential customers. A well-targeted audio ad can generate serious interest, and rapidly convey brand identities. 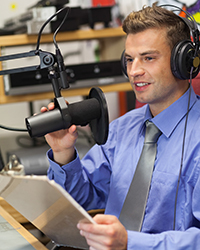 We at MarketFirstUSA have decades of experience producing voice-overs for radio, television and Internet ads. We understand not only the effectiveness of audio in marketing, but also the dynamic, increasingly social way these messages are experienced. "Word of mouth" has had its reach hugely amplified by social media, and hearing something leads naturally to talking about it. People will frequently talk (or tweet) about products and companies that interest them or reflect their needs. Audio ads can easily be integrated with marketing outreach in other venues to reflect a unified, consistent brand identity. They can be informed or otherwise guided by video messages already established. Call MarketFirstUSA today at (847) 656-5365 to discuss how this overlooked yet powerful advertising tool can be incorporated into your marketing program.